A Radi-CAL CAL-lapse, but techni-CAL-ly, not a CAL-amity… thanks to Reeves Nelson. With 10 seconds left, Cal hit a 3-pointer to tie UCLA at 84. 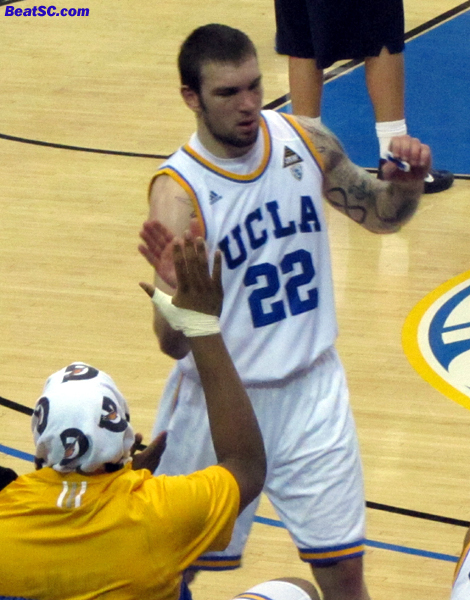 Then Tyler Honeycutt raced down the floor (because UCLA was out of Time Outs, as usual), and got a pretty good look, but his 10-footer didn’t drop — Then, out of nowhere, Reeves Nelson came flying through the air, and just as the ball came off the rim, he tipped it up and in to give the Bruins the lead with 2 seconds remaining. The Bears hurried the ball in bounds (because they were also out of Time Outs), and heaved up a 60-foot prayer at the buzzer which didn’t come close, allowing the Bruins — and the fans that stuck around — to start celebrating. Of course, the game should never have been that close, after the Bruins had played well for 30 minutes, building a 15-point lead on the strength of Nelson’s scoring (he got a career-high 24 Points), and Tyler Honeycutt’s return to form. Honeycutt hit 4 3-pointers to score 15, in his best shooting performance since he hurt his elbow a few weeks ago. He got an x-ray yesterday which was negative, and maybe not being able to blame the elbow made him get his focus together and hit some shots. For a pure shooter like Honeycutt, shooting is mostly mental, and being focused could make all the difference. Nelson racked up a double-double, by collecting 10 Boards, and he looked determined to shake off last week’s forgettable showing. He was emotional, active, energetic, alert, and he even showed noticeable improvement with his body control — He AVOIDED several charging calls that he would have picked up in previous games, by stopping his momentum JUST in time. Nelson’s tip-in saved Honeycutt from a little bit of goathood, as Tyler’s Turnover in the final seconds allowed Cal to tie it up. In fact, several Bruins made miscues in the final minutes as Cal stormed back from the big deficit. UCLA couldn’t inbound a pass within 5 seconds, they had a miscommunication lead to a ball being thrown away, and they committed numerous unnecessary fouls that stopped the clock and put the Bears at the line for freebies. Brendan Lane and Malcolm Lee actually fouled out during this flurry of fouls. But it was at the line that the Bruins staved off defeat. Lazeric Jones, who also achieved a new career-high with 24 Points, hit 8 of 9 Free Throws in the final moments, to keep the Bears in panic mode. All those Bruin fouls didn’t help UCLA play good defense in the 2nd Half — Cal still shot 72% after Intermission. After Lee (and Honeycutt) held Cal’s recent Offensive star Allen Crabbe to virtually nothing in the First Half, he ended with 17 Points, including the game-tying Three. Apparently, the Bruins adjusted their Defense at Halftime, because Cal Forward Harper Kamp scored 17 in the 1st Half. He got only 4 more after that, but Crabbe and the rest of the team picked up the slack. The Cal Guards were suddenly able to get to the hoop, as foul trouble and lack of awareness doomed the Bruin D. However — You also HAVE to credit California, for not quitting, even as the fans filed out, thinking that the game was over. One other huge factor in the Bruins’ rapid decline: Center Joshua Smith had to sit out the 2nd Half with neck pain. Smith was highly effective in the 1st, scoring 4 and grabbing 5 Boards (4 Offensive) in just SIX minutes of play. But after getting knocked to the floor awkwardly, he was unable to return. His absence was a huge drain on Lane, who was repeatedly victimized on Defense, before he fouled out. Lane did, however, shoot the ball FOUR times (finally! ), making 3, for 7 Points. Anthony Stover actually started the game, and made a few nice plays on D and got 4 big Rebounds, but didn’t score. The bottom line is that Smith is NECESSARY for the Bruins to succeed. Tyler Lamb got 10 minutes of playing time, but didn’t do much Offensively, going 0-3 with 1 Rebound. Once again, he passed up open Three’s to make head fakes, only to wind up missing, shorter, more contested shots. Luckily for UCLA, their OTHER back-up Guard was very effective on the Offensive end. Jerime Anderson hit only 1 of 6 shots, but he looked like Ralph Jackson with his PASSING. Anderson tallied FIVE Assists in just 16 minutes, with no Turnovers. Actually, he lost the ball against heavy pressure during crunchtime, but the ball wound up in Bruin hands. Still, it demonstrated that he can’t be trusted to take care of the ball against a tenacious, desperation Defense. However, for the rest of the game, he was the best set-up man on the team — a marked improvement for him over earlier in the year, and over last year. UCLA would NOT have been able to build their lead without JA. After the last game, I said that if Tyler Honeycutt snaps out of his funk and if Reeves Nelson bounces back from the worst game of his career, the Bruins would be okay, and that’s what happened. Now if Joshua Smith can come back from his neck injury, UCLA should extend their winning streak, and continue to build up their resume for a possible return to the NCAA Tourney, where the Bruins can sink their claws into a little Christmas in March. But if they don’t make it, I’ll need a Sanity Clause. "ESCAPE CLAWS" was published on January 21st, 2011 and is listed in Blue & Gold News, UCLA/usc/Sports Photos.